In recent years, many people in the West have been exposed to the teachings of the Buddha through the practice of Vipassana meditation as taught by S.N. Goenka. Mr. Goenka was born in Burma (now Myanmar) where he learned this technique of meditation from Sayagyi U Ba Khin, who had in turn been taught by Saya Thetgyi. Saya Thetgyi had the fortune to learn Vipassana from the highly respected scholar and meditator monk Ledi Sayadaw. In Burma, Ledi Sayadaw is well known, and in his lifetime was the author of more than 100 books that provided both clarification and inspiration regarding the teachings of the Buddha. As Vipassana meditation in the tradition of Ledi Sayadaw begins to spread in the West, we are fortunate to begin to gain broader access to his writings as well. 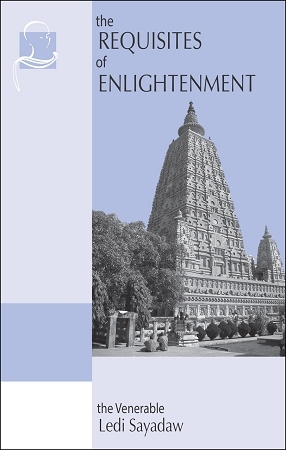 In The Requisites of Enlightenment, the first of Ledi Sayadaw's books to be published in the West, he explains the bodhipakkiya dhamma: the 37 requisites of enlightenment. The requisites are comprised of the four foundations of mindfulness, four right efforts, four bases of success, five controlling faculties, five mental powers, seven factors of enlightenment, and the eight factors of the Noble Eightfold Path. This book is valuable to those interested in understanding the Buddha s teaching at a deeper level, while providing the inspiration to continue walking step by step on the path. Available here in print, audiobook (free), and PDF (free - see below). Click here for the multi-format eBook (PDF, ePub, Mobi) version. I purchased this book for obvious reasons...to find out what I have and haven't done to progress in the most important endeavor a human can undertake. The wisdom in this book showed me what I needed to know and do. The only thing that didn't work well for me was the constant reliance on Pali words and verse. I realize that there are many concepts, vibrations, and meanings that cannot be communicated in the English language. All Pali terms and verses were well defined in the text and glossary. But the constant need to reference the meaning of the Pali words made the book difficult to read in a flowing manner, making the comprehension difficult. Although, with diligence and strong determination, the concepts became clear. For a deeper understanding of the practice of vipassana, these words are very powerful, very helpful in the long run.